Paris Kea shoots over Kai Crutchfield and Kiara Leslie. Chris Baird photo. 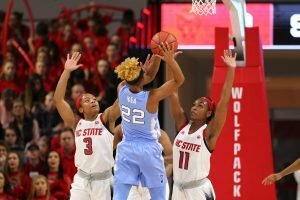 Raleigh, N.C. – For the second week in a row on Sunday, North Carolina toppled a top 10 team. This time it was previously-unbeaten No. 7 NC State, which saw its program-best 21-win start snapped by a gritty Tar Heel performance. Stephanie Watts led the way with 20 points, which included a buzzer-beater three-point shot with 1:49 to go that gave her team energy down the stretch. 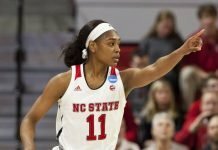 Last weekend North Carolina upended No. 1 Notre Dame. Tar Heel coach Sylvia Hatchell said players were able to carry that momentum into their next two match ups. There were eight ties and 12 lead changes in the third quarter. 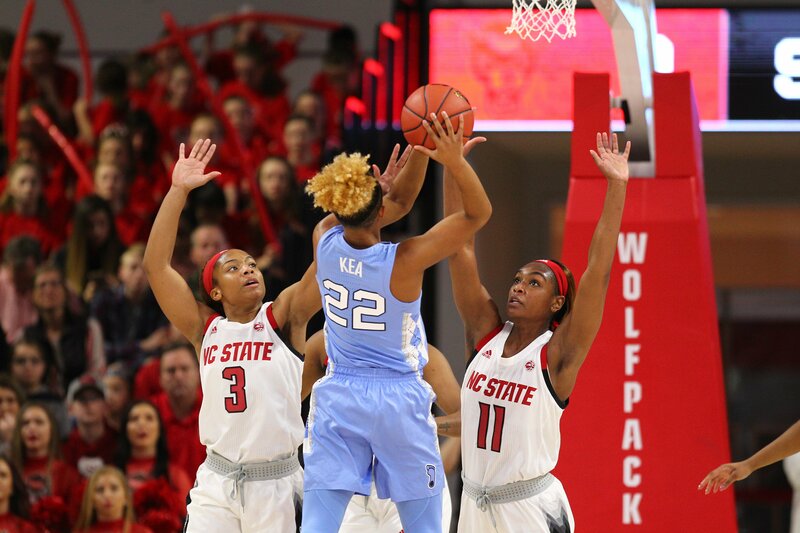 During the game’s key stretch, the visitors kept the Wolfpack from scoring a field goal from 6:52 in the third quarter until 6:48 in the fourth. By that point, North Carolina had mounted a 54-45 lead, which they never relinquished. Janelle Bailey, who scored 16 points and grabbed 13 rebounds, said clamping down on defense made the difference. Paris Kea, who finished with 17 points, scored mostly in the second half. She said she found other ways to contribute during the dry spell. 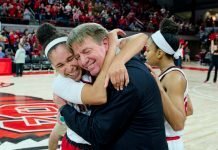 The team appears to be coming together at precisely the right time to mount a stretch run moving towards the ACC Tournament, both in terms of chemistry and level of play. 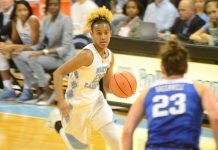 Erika Cassell splits the North Carolina defense. Chris Baird photo. 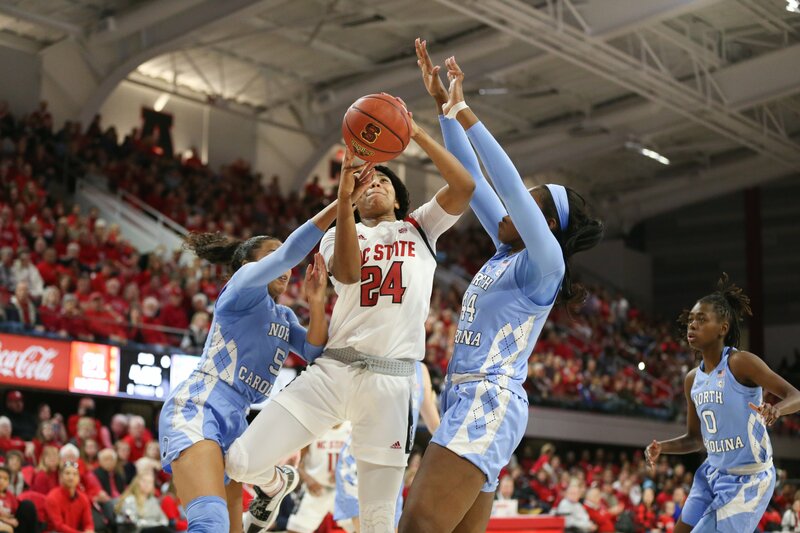 Kiara Leslie had 17 points and 12 rebounds for NC State, while Aislinn Konig had 13 points and Erika Cassell, eight. No one else got close to double digits. Coach Wes Moore cited a lack of offensive aggression for the team’s struggles. Leslie said their slow start affected their shooting. Cassell said the team is ready to move on in having their winning streak snapped. Moore said his team will learn from the loss. 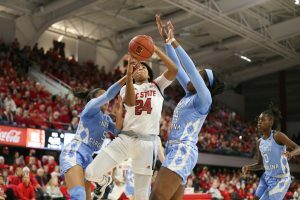 The Wolfpack now enters a tough stretch against three ranked opponents, with their next game at No. 24 Florida State on Thursday. North Carolina will host archrival Duke in their first match up of the week.